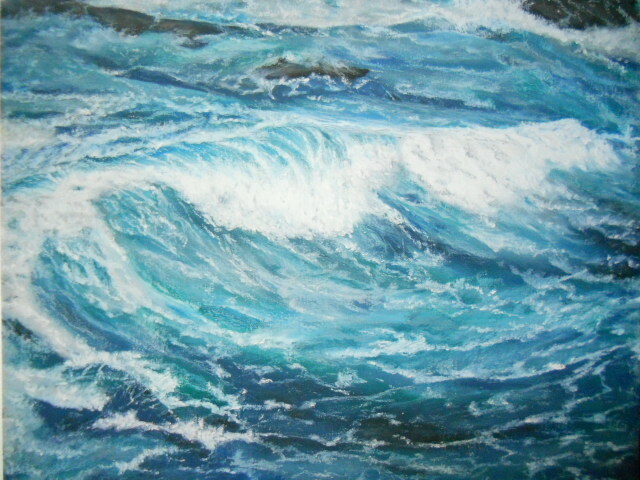 Drawing the sea is turning out to be a good experience, thoroughly enjoying the process. I’m a bit preoccupied these days and find this particular drawing a form of relaxation. Today my time was spent drawing the middle-water, developing the flow of the water and the water building up and coming off the waves using graphite #2H and #HB. The interesting part of developing the tiny wavelets/ripples (too much in the middle section that will be fixed) in some areas is like drawing rocks such as the scene I did two drawing projects ago called, Water Veil. It’s all about establishing correct value ranges – love it. The water is by no means done, a lot has to be completed to develop the proper flow and depth with value ranges. Silly as it sounds I can feel the pull of the water as it’s being worked on. Next week the horizon line will be fixed, the middle-ground water / foreground water and flat slab of rock drawn in, and if time permits work more on values so the waves and lines within this drawing connect and are cohesive – in other word make sense to the viewer. Notice the frisket? It’s still on keeping the large wave/sea-foam areas clean while the rest of the water is being worked on. Once removed those two large waves coming into the shore will be drawn and then finally I’ll tackle the “waiting” Egret. I’m already feeling the power of the current as well! Thanks Linda – hope you are enjoying your weekend. 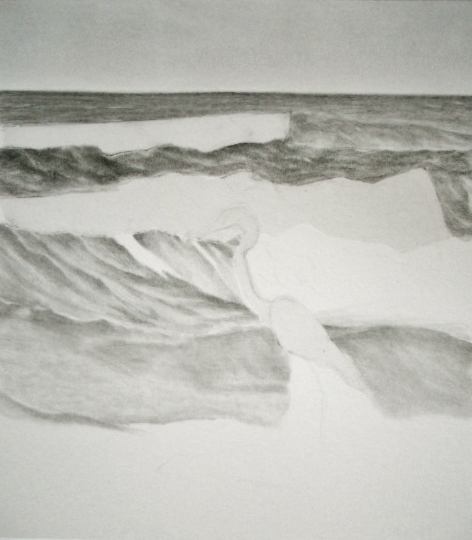 I adore your seascapes,and to see one taking form as a drawing is fascinating. Thank you for letting see the progress of a picture. Thank you Patricia for your beautiful comment – let’s see where this one takes us. I think it’s going to be very interesting when I start working on the sea foam and incoming waves – stay tuned. Thank you Poppy for your nice comment – I can’t wait to really dig into this drawing and see proper development. Have a beautiful weekend star gazing! I’m very interested in the idea that you find some forms of your art more relaxing than others, Mary. Why is this …? Thanks M.R. for my personality – I like to have some control, with that comes relaxation when I’m working. Drawing gives me that and I don’t know why (except the ballerina’s legs and feet, lol), oil pastels have so many variables that can take you off your game so quickly and it’s very tough to make changes once the OPs is down. By nature M.R. I’m more of an analytic which I thinks hinders my freedom as an artist – you know the ability to just let go. One day I’m going to undo the harnesses and just have at it . . .
Great progress, Mary! I think the horizontal line as it stands adds a touch of realism and anticipation: something is rolling in the distance, and it’s up to the viewer to concentrate and determine what it is. Your graphite technique is really neat—I always run into the trouble of smearing what I drew, and I’m not even left-handed! Thanks Millie – smearing, that’s one of the reasons for using the frisket on the white caps of the waves for now (keeping them clean until I’m ready to work on them), but also I have four pieces of paper covering areas of the drawing as I work so I don’t rest my hand or touch the drawing with my fingers. It’s a fun piece to work on – thanks so much and have a beautiful weekend. The paper is a prudent solution. I will have to try that sometime when I’m working with graphite. Thanks for the tips, Mary, and have a beautiful weekend yourself! Your right Cynthia, it’s a very interesting exercise trying to develop the nuances of the sea with graphite values, I want to rush right in and attack areas I see that need to be refined, but it’s too soon. Ah, and there is the challenge – thanks so much. Have a lovely weekend. Hi Rhonda, perhaps that is my challenge – holding back and taking my time to not finish these drawings in one or two sittings. The 1/2 hour or 1 hour of Thursday drawing gives me an opportunity to see the piece with a different eye and also teaches me some discipline. Hope you have a wonderful weekend.